I rarely buy bread these days, when we have bread, I usually make my own sourdough. The only problem with sourdough is that you have to plan ahead. Making a loaf is a two-day process, so you can’t suddenly think “I fancy a sandwich”, and then start making the bread for it – you will have fainted with hunger long before it is ready. So what is a hungry person to do? Soda bread, of course. It’s incredibly easy to make, and astonishingly quick. You can go from “what can I have for lunch?” to biting into a hunk of warm, fresh-from-the-oven, butter-slathered soda bread in under an hour. And this is proper bread. No chorleywood nonsense here. Soda bread isn’t made with yeast, but, as the name suggests, it uses bicarbonate of soda as the raising agent. There’s no kneading and waiting for the bread to prove – the soda reaction is instant. As soon as you’ve mixed the dough, you have to get it into the oven immediately, lest those precious gas bubbles escape. Consequently, it doesn’t have the smooth elegance of other kinds of bread. It usually has a rough, lumpy surface – a rugged sort of look. But pay no attention to its aesthetics, for it is delicious. Hot from the oven and smothered with generous portions of butter, or cold, with lashings of strawberry jam – however you serve it, it is a tasty treat. It makes a great accompaniment to soups and stews and casseroles, or just as a snack on it’s own, with a little cheese and pickle. There are countless recipes for soda bread and a quick search on the Internet will reveal endless variations. Just lately, I’ve often been using Hugh Fearnley-Whittingstall’s recipe from River Cottage Everyday. Mmm, just thinking about this makes me want to make some. Maybe I will later. 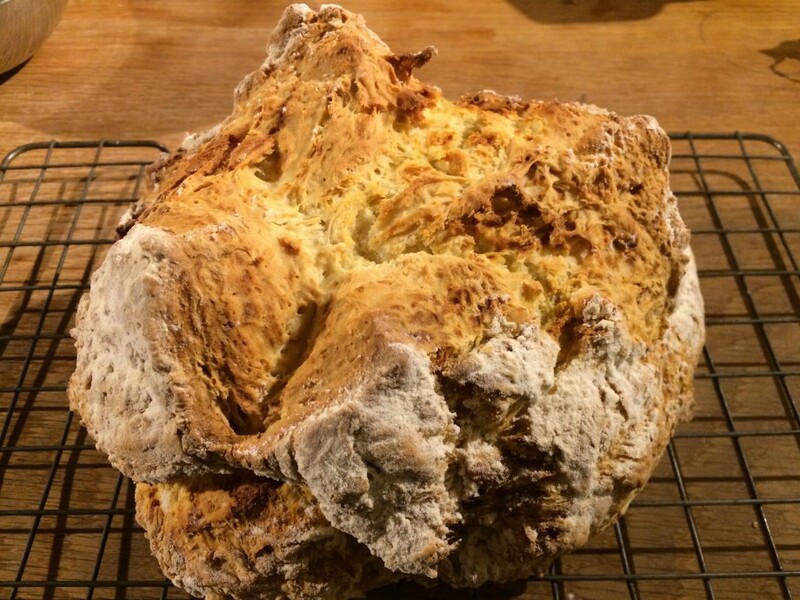 Make soda bread, using the recipe of your choice.